The Huntingdon County courthouse tower is visible from the mainline on the sweeping curve entering from the east. Note the access road along the right of way which used to be the alignment of tracks 3 and 4 the former westward freight and passenger tracks respectively. Situated roughly 98 miles west of Harrisburg, Pennsylvania the Borough of Huntingdon, Pennsylvania sits along the beautiful Juniata River and the former Pennsylvania Railroad mainline. A county seat for it’s namesake Huntingdon County, the town was situated among rich agricultural areas, healthy deposits of iron, coal and clay, and hosted manufacturing including stationary, furniture, lumber and machinery. Originally laid out by Provost of the University of Pennsylvania, Rev. William Smith in 1777 the town was dedicated as the county seat in 1789 and incorporated in 1796. The Borough was once a port on the Mainline of Public Works, and later the junction of the PRR and the Huntingdon and Broad Top Mountain Railroad and Coal Company. Today the town is better known for its quaint layout, beautiful landscape and Juniata College which plays host to approximately 1500 students. Entering from the east the relocated mainline of the late 1890s runs along the former Public Works Canal alignment. Here at the mouth of Standing Stone Creek we are standing below the "new" bridge looking north toward the remains of the original alignment and stone arch bridge that runs parallel to Penn Street. The Pennsylvania Railroad gained its presence in the Borough in June of 1850 with the completion of a line from Harrisburg, originally entering town along Allegheny Street. Modernization and relocation of the mainline later took place in several stages; first in 1891 and then 1894-1900 constructing the standard four track system, using the original Mainline of Public Works canal as a new right of way. The project eliminated several curves, grades, and street crossings while providing the citizens of Huntingdon connections with points east and west. 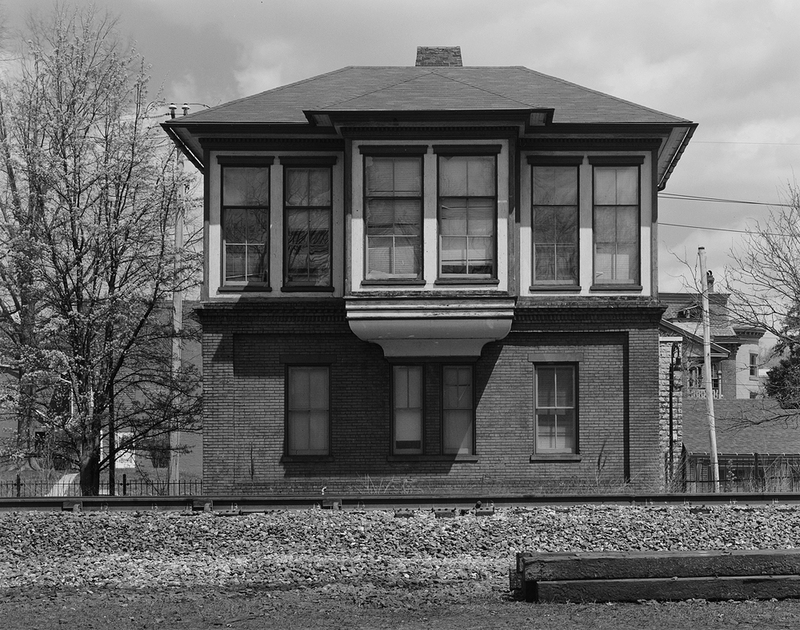 The 1872 Huntingdon train station is an Italianate style brick building. Detail of the (post 1890's) trackside elevation, while the traditional PRR herringbone brick pavers undergo restoration in the Spring of 2011. PRR Hunt tower has been inactive for some time but remains standing. It was operated for a short time as a museum but now houses city offices. Built during the second phase of the modernization Hunt Interlocking, a brick and frame structure housed a Union Switch and Signal machine to control a revised interlocking and interchange with the Huntingdon and Broad Top Mountain Railroad and Coal Company (Reporting marks HBTM). The HBTM was a coal hauler chartered in the 1850′s to tap the rich semi-bituminous coal deposits and provide shippers in the Cumberland, Maryland area providing an alternative to the B&O’s monopoly on train service. Over time the railroad suffered major setbacks including the diversion of traffic off the line by the PRR to its own line between Bedford and Cumberland which led to eventual bankruptcy in the early 1950s. The Huntingdon train station provided riders a cross platform transfer to HBTM trains which ceased operation in November of 1953. Little is left of the interchange and station tracks except for an overgrown branch diverging just west of the interlocking plant through Portstown Park, crossing on a deck girder bridge over the Juniata and running a short distance along State Road 3035. In addition to the interchange and passenger facilities, the PRR maintained a freight station and mainline icing facility west of the station area for trains of refrigerated meats and produce prior to mechanical refrigeration. Today, while the mainline has been reduced to two tracks, the railroad is still very busy, though no interchange takes place with the HBTM, intermodal, merchandise and mineral traffic rolls though at speed along a mainline refined in the late 1890′s to efficiently expedite traffic to points east and west. The Huntingdon County Chamber of Commerce has taken residence in former Hunt Tower, and the landmark 1872 train station has been renovated and is being used for commercial space.